Welcome to my 2nd trouble ticket post. It has come a bit later than I would have liked but have been having all sorts of other fun to deal with and let’s not forget the two weeks of the Olympics when I hung up my study cap completely. To recap, in this category of post, I cover an issue I have come across that stands out for one reason or another. In Trouble Ticket #1, I covered a problem that put Cisco TAC on the back foot. In this ticket, I discuss an initially strange-looking problem which did get resolved but not before I got led on a wild goose chase. The problem reared its head when I was determining why it appeared that the first /26 of a /24 was reachable yet the second /26 was not from a management station. What stirred things up was when I did a traceroute for an IP that was known to be available and a hop that I thought should be in the path was missing. The diagram below is a simplified topology. What I didn’t see, and was expecting to in between steps 1 and 2 was the ASA firewall at 172.16.1.3. There was no ‘Request timed out’ message. The step was missing entirely. 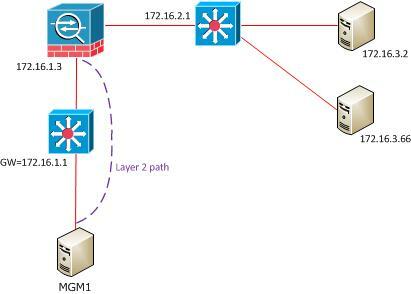 For the curious, the 172.16.1.1 address is the gateway address for all management hosts but holds routes for all the infrastructures it needs access to, hence the two hops within the same subnet. The strange thing was, it was the same number of hops either way so there was still something missing regardless of which path was being taken. I decided to err on the side of caution and went back to the GW, checking things like ARP caches and CEF adjacencies. Everything looked as it should. So off to the Cisco Support Forums I went and after several attempts to craft the correct search, I came across the answer I had been looking for. It turns out that the firewall was not doing something that was hiding it from the traceroute output. In brief, a traceroute works by sending an ICMP packet to the destination IP with a TTL of 1. When the next hop (in the first case, the default gateway) receives this packet, it decrements the TTL to 0 and sends a ‘TTL expired in transit’ message back to the source. The source then sends another ICMP packet to the destination with a TTL value of 2. The GW will forward this on to its own next hop for the destination, after decrementing the TTL to 1. As this packet hits the next hop, the same ‘TTL expired in transit’ message is sent back to the source. This continues until the destination hopefully responds. The traceroute command can therefore display each hop by using the IP address of all devices that respond with the ICMP messages. From the contextual help on the ASA’s CLI, it appears that this behaviour is applied to all IP based traffic, not just ICMP traffic. It should be noted that the config above only applies to ASA versions 8.0(3) and later. It should also be noted that the initial issue I was seeing that got me to this point i.e. part of a subnet responding, part of it not, was down to the fact that this subnet had been previously addressed differently. 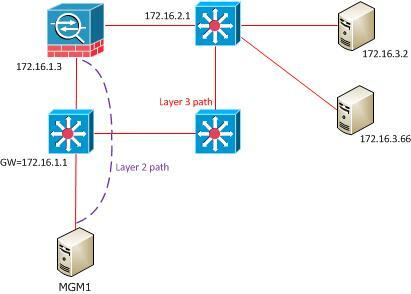 When the subnet was made larger to a /24, all devices were readdressed correctly, the security ACLs on the firewall were updated but there was a NONAT ACL that was still configured for the previous /26 subnet. I updated that too and return traffic, now matching the NONAT ACL, was not NAT’d and was returned as expected.